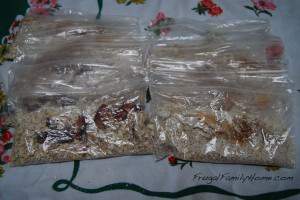 Today’s freezer cooking is Oatmeal Packets. I know this is more pantry cooking but we were out of oatmeal packets so I thought it would fit right in with the freezer cooking. 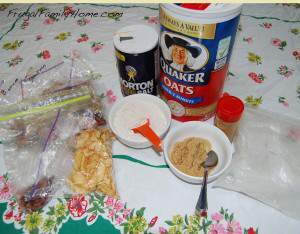 If you want to go with Money Saving Mom’s freezer cooking schedule, today would be Freezer Friendly Baked Oatmeal. I have never made baked oatmeal before so I thought I would stick to something I know we like. I will give the baked oatmeal a try another time though. The kids helped me make our oatmeal packets. I like to make these so I can control the amount of sugar going into them and we can pick our own flavors this way. 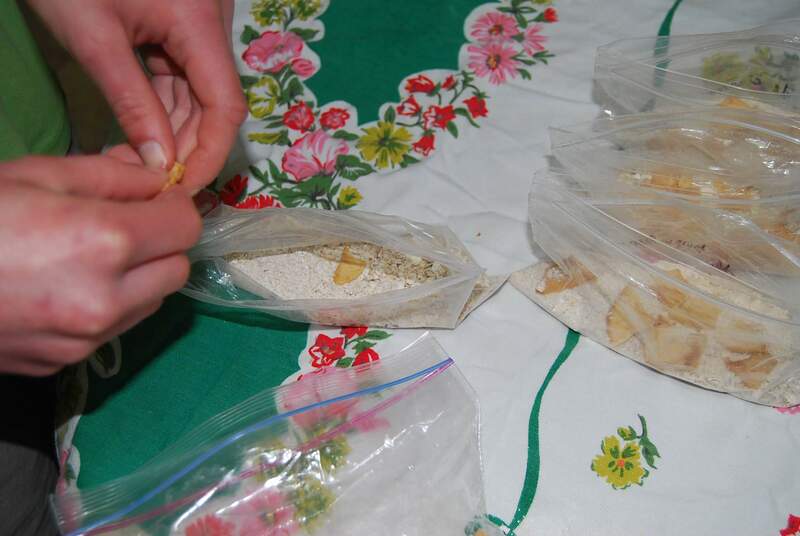 Today we made Strawberry Packets and Pear Cinnamon packets. 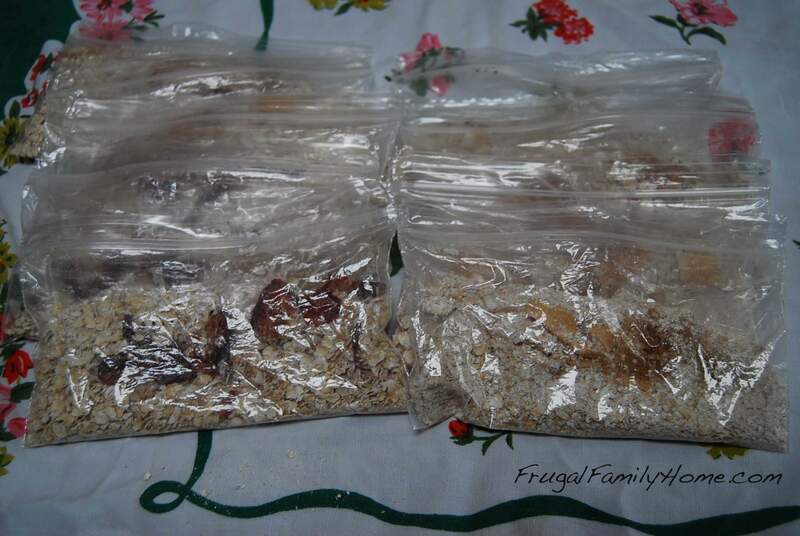 First I measured out 1/4 cups oats, 2T ground oats and 1/8 teaspoon of salt into each of our 9 baggies. 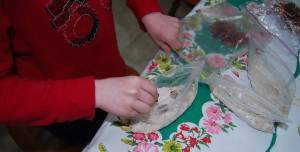 Then the kids helped by adding the dried fruit. We had some pears and strawberries that I had dried. My son added some strawberries to some packets. My daughter broke the pears into smaller pieces and added them to the other packages. Once we were done adding the fruit. I sprinkled a little cinnamon into the pear packets. 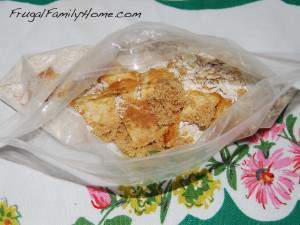 Then I added about 1 teaspoon of brown sugar to each packet. Then we squeezed the air out of each one and sealed it. These little packet are so nice to have on had and cost very little to make. So that is our freezer or pantry cooking today. You can add any different combination of fruit to each packet that you like. You can even add a little powdered milk to each one to make fruit and cream oatmeal. If you like these sweeter then just add more sugar or you can leave the sugar out altogether. Freezer cooking for monday will be baking mix day. I will be using Money Saving Mom’s recipe for the baking mix. We can’t have dairy so I will substitute our dairy free powdered milk for the regular powdered milk in the recipe. 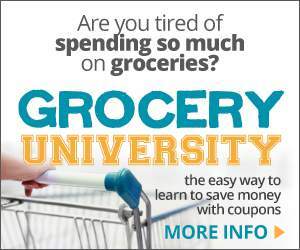 Did you do any pantry cooking or freezer cooking today? So cool to have the oatmeal at-the-ready. 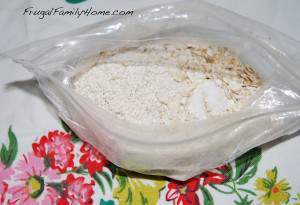 I bought 3 containers of oatmeal recently, and I’m planning on trying out a new recipe with the oatmeal soon. They’re going to be no-bake cookies, and I’m *hoping* the kids like them. 🙂 If I can get caught up on some things, I’d love to join in the MSM freezer cooking, too! I grew up eating the no bake oatmeal cookies. I hope your kids will like them. Those sound like wonderful flavors! Love your dried fruit! Donna, we really like being able to pick our own flavors. Because of my family’s milk allergy we are limited on which flavors we buy at the store. How neat. Love the kids getting involved. Both my kids like to help with any cooking. They are really good helpers to me. Might be a silly question but what’s your process to dry the fruit? Thanks! Mrs. A, I have a food dehydrator that I use to dry our own fruit. It works great. I wash the fruit, slice it and then dry it until it doesn’t have any moisture pockets. I hope that helps.